Learn when to choose different reverb types, whether to make your reverb dry or wet, how to set pre-delay and reverb time, the significance of density and damping – and, of course, why reverb size matters! Reverbs that are felt: Short reverbs, for example those emulating small- to medium-sized rooms, will add clarity and realism to a sound without clouding the mix (unless you mix them very high). This is necessary to create separation between instruments and prevent your mix from flattening out when you hit your mix buss compressor. Reverbs that are heard: Halls, plates and other long reverbs will add power and depth and can creatively enhance performances. 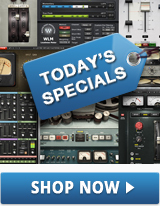 Generally, lead instruments and important elements of a mix are treated this way. It is crucial to be selective with the elements of a mix you enhance with “large” reverb, or your mix may become washed out and lacking in presence. In this audio example, a long plate reverb (created using the Abbey Road Reverb Plates plugin) is added to the snare. In the end, it is the blend of these two approaches that is essential to effectively using reverb in a mix. Fortunately, practically every DAW offers Sends and Auxiliary or Effect Tracks. The ability to set and automate the send, as well as to set, automate and process the return signal independently provides a maximum of options for a small bit of extra time and effort. If you are not familiar with send and return configurations, consult your DAW’s manual for the specific steps. The first parameter to adjust when setting a reverb is size. Size determines the boundaries of the space in which the reverb will exist. The perception of size comes largely from the timing of early reflections as blended with the dry, unaffected signal. Early reflections are the first delays that come directly from the floor, ceiling and walls. Their timing and frequency response send the necessary binaural cues that allow the listener to recognize a dimensional space. The best way to set the size of a space is to begin by adjusting the reverb’s mix control so that you only hear the early reflections. Raise the level of your effect return track loud enough so that you can clearly hear the adjustments you are making. Next, adjust the size until you find the space that best fits the effect you are trying to achieve. Using a smaller size setting for “felt” reverbs will add immediacy and life to a sound. 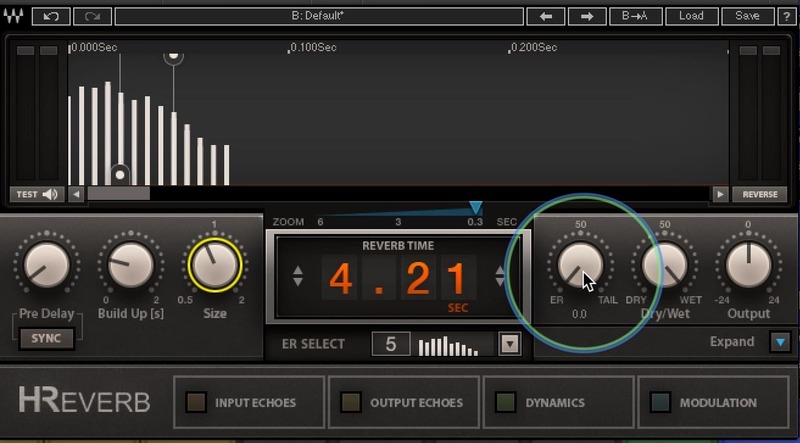 Using larger size settings for “heard” reverbs will add depth and power. Plugins like H-Reverb and Renaissance Reverb offer finely adjustable parameters for early reflections, which can greatly affect the perception of space. Generally, reverb time for most instruments will be based on the tempo and pace of the part. The faster the tempo, the shorter the reverb time will have to be. Slower tempos often allow for longer reverb times. The exception to this rule of thumb has to do with the “pace” of the part in the context of the song. If you have a vocal performance with long, sustained notes in an up-tempo song, you will have enough space for a longer reverb. Conversely, if you have a rhythmically busy part in a slower tempo song, you will have to shorten the reverb time to prevent the reverb from washing out the direct sound or the mix as a whole. 5. Reverb Type: Natural Sound or Creative Effect? Each type of reverb, natural or unnatural, will exhibit a unique characteristic that is important to consider when setting up a sound. Reverbs that emulate the natural sound of real-world acoustic spaces, such as those available with Waves IR1 Convolution Reverb and its companion sample library, are the easiest to set up. In general, room settings are better with shorter or smaller reverbs, halls and churches are better longer or larger spaces, and chambers usually fit somewhere in between; just as they would be in real life. Reverbs that do not directly emulate the realism of physical spaces – such as the non-linear, reverse or gated effects of Renaissance Reverb, or mechanical reverbs like springs or plates – are often used to add a creative character to a sound. They can also take a somewhat generic performance or sound and breathe life into it. 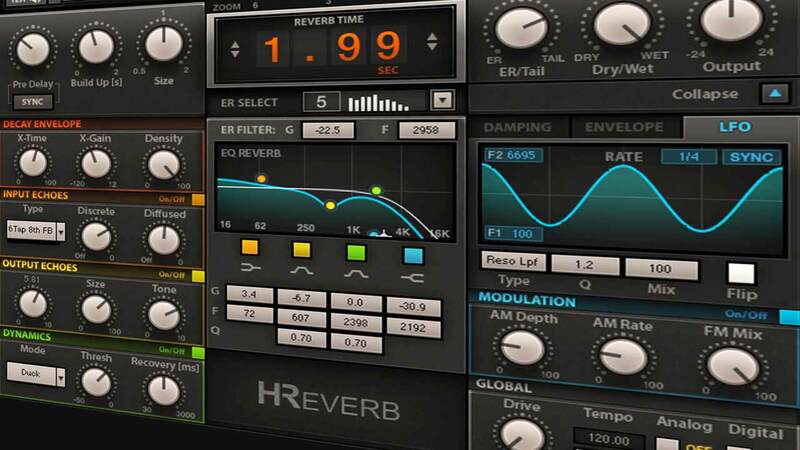 A general guideline for selecting a reverb type is to find one that contrasts the characteristics of the performance. Generic drum performances will sound more alive with a gated, non-linear or reverse reverb. By contrast, a lively piano performance would be better served by a smoother or natural reverb type. 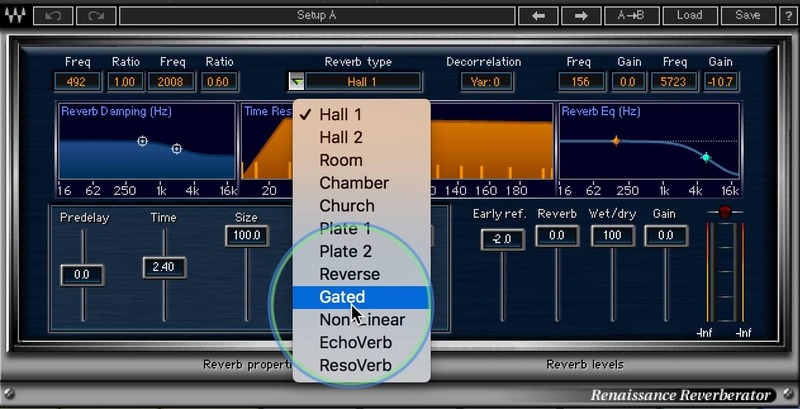 Many digital reverbs like the Renaissance Reverb allow you select specific reverb types. A good guideline for setting pre-delay times is to match them to the size of the space you are setting up. Think 0–10 ms for smaller size spaces like an average-sized bedroom, 10–20 ms for medium-sized spaces, and over 20 ms for larger spaces like halls and churches. Keep in mind that these ranges are relative to the tempo, pace and density of the production, so it is usually best to adjust pre-delay in the context of the whole mix rather than in solo. Diffusion and density are two terms that describe the same aspect of a reverberant field: the number of reflections over a given period of time. The more reflections, the more dense or diffusive a reverberant field will be. Dense reverbs can add body to thin, pinched or lifeless sounds. Low-density settings are generally better for larger, more open sounding reverbs. Damping is a way of controlling the reverb time at different frequencies. In general, high-frequency reverberant energy will decay more rapidly unless the room has very hard surfaces like tile or stone. It is very common to adjust damping and diffusion settings at the same time, since together they shape the tonal character of the reverb. For example, a very short room reverb with a high-density setting and the high-frequency damping shortened will add body to a thin snare or vocal sound. Conversely, if you shift the damping to have less low-frequency reverb time and more high-frequency reverb time, you can add presence to a dark snare or vocal sound. It’s one thing to get a great reverb sound in solo, and another thing entirely to get it to work in the context of a whole mix. We have all experienced this dilemma. With a bit of strategic planning, however, most of these problems are easily overcome. Strategy #1: Contrast your reverb types. It is a common strategy to set up the reverb sound for the lead vocal first. If you pick a hall reverb for the vocal, do not use a hall on any other sound in the mix. This will make the lead vocal reverb unique. This is a common approach for mixing solo artists, where you want the vocal front and center. Strategy #2: Use a single reverb type. If you are looking to create a very wet mix to achieve a ‘live performance’ vibe or just for creative purposes, using a single reverb type for all the sounds will establish a singular space without conflicting information smearing the depth field. However, rather than feeding all instruments into the same reverb plugin, set up multiple instantiations on separate busses for separate instruments with the same basic settings, so you then can tailor the parameters for the specific needs of each. Strategy #3: Be very efficient with reverb settings. It is often a good strategy to use very tight reverb settings that are adjusted to the sound of rhythm section instruments. Mono reverbs work great on guitars – and sometimes a slap delay might be more effective than a full reverb. Try to keep the reverb times as short as possible. This efficiency approach is great for in-your-face productions that leap out of the speakers. We hope this information will help you open a new world of depth and space in your mixes. If you want to dig deeper, you can discover many more reverb tips and tutorials here.